This new and very luxurious chalet located in Courchevel 1850 in the privileged area of Nogentil is available for rent from the season 2012/2013. Chalet Coquelicot is available throughout the year. With 6 bedrooms and suites, the chalet and its living space of approximately 610m² (6565ft²), can accommodate up to 12 people in magnificent surroundings. 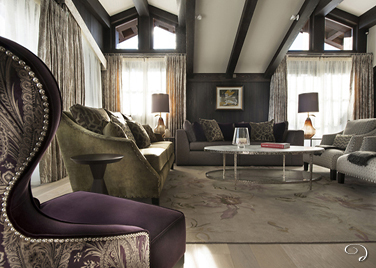 The unique interior of Chalet Coquelicot was designed by the prestigious interior designers BEVEN WILKINSON. To give Chalet Coquelicot its refined atmosphere, the designers, John Beven and Richard Wilkinson, made bespoke furniture and chose special fabrics and precious ornaments. Project management and implementation were carried out JML INTERNATIONAL, major player for ten years in this specific field. The chalet combines refinement, comfort and modernism enjoying high-tech equipment, while maintaining an atmosphere of sophisticated mountainside. It offers among others : a swimming pool, spa with massage room and a lift serving each of the 6 levels of the chalet. The living room with open fireplace, dining room opening onto a large terrace, TV lounge, fitted GAGGENAU kitchen with dumbwaiter. The master bedroom of about 46m² (452ft²) with TV room and splendid bathroom, a second double bedroom and bathroom. 3 large double bedrooms with their bathrooms. A double bedroom with bathroom, ski room. Garage, laundry, space for staff and outbuildings. The beautiful swimming pool 10m x 4m with jacuzzi, hammam, massage and relaxation rooms. Welcome to chalet with Champagne and macaroons, manager attributed to the chalet, driver booked for travel in the resort, 8 hours of maid service daily performed by two people, butler and chef, house linen (sheets, towels and bathrobes etc. ), change of linen twice per week, maintenance of chalet and swimming pool, internet access, taxes for the stay, consumption of water and electricity are also included. Daily linen change, travel by helicopter or taxi, car hire, ski instructor, etc.